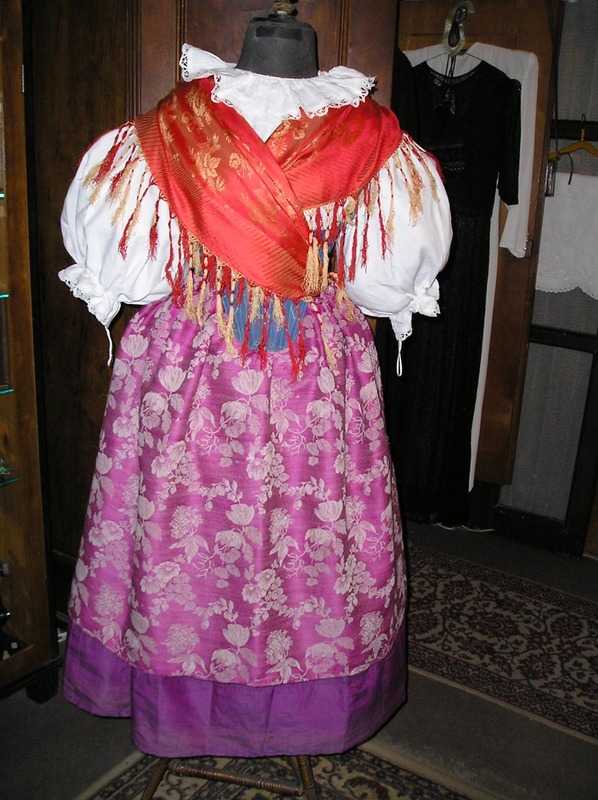 A typical characteristic of the Plzen National costume is the very pretty bonnet with large bows tied at the back. These then create a large “dove”. It is the most recognizable costume due to it’s decoration of the head, the width of the skirts, and beautiful embroidery on the dove as well as the apron. Many other variations of this national costume came from this particular type and many of them are worn on a number of special occasions. It is certain that it underwent many changes. There were many influences in such a rich and socially active region as Pilzen. Busy markets in the city itself had a major impact on the surrounding area as well, fancy fabrics were imported, decorations brought from different towns, therefore the fashions of the city affected the villages as well. Despite its age the costume managed to keep some part of it’s origin. We can trace this history back to the 17th Century. The bonnet, as well as the jacket of the ladies costume, resemble the Renaissance time, bodice and the wide skirts the Baroque period. The most beautiful hallmark of folklore art, the embroidering, reached it’s height around the years 1820 – 1860. We can admire this skill throughout collections of the city museum in Pilzen. Today, the national costume is not worn regularly. From time to time you can meet village women wearing wide skirts, tight jackets made out of contemporary fabrics, covering their head with scarves. The Pilzen costume consists of shirt (rukávce) made out of white linen, down to the waist; below the waist was added a strip from the canvas or another material. In front the shirt was cut down to the waist. Around the neck the shirt was ended with a hem, through which a string was pulled. Bobbin lace was sown to the edges, creating a round and so called krajzl. This part was made from specially thin linen, embroidered in front and tied with a red ribbon. The bracelets of the shirt were decorated with white, red or blue embroideries. Sleeves are about 1.20 m wide and long up to the elbow. They were tied above the elbow. Sleeves ended with frills and decorated with a bobbin lace as with the neck (collar). For Sundays and holidays sleeves were stiffened by starch. Bodice (živůtek) was worn over the sleeves and latter called šněrovačka and always made from the most expensive fabrics, silk, ornate with woven brocade, golden flowers, concentrated in the front or the back to be the most visible. The back part of the bodice ended with two tails. Red ribbons were again used for decorations. The bodice was always cut smaller and in front tied by a thin red ribbon. In the space under the ribbon a pad in the shape of triangle called punt was placed. Its top was reaching the waist and the top was gently cut in the shape of a bow. There were two types of bodice, one for holidays with whale bones, and another for daily use made out of linen only. 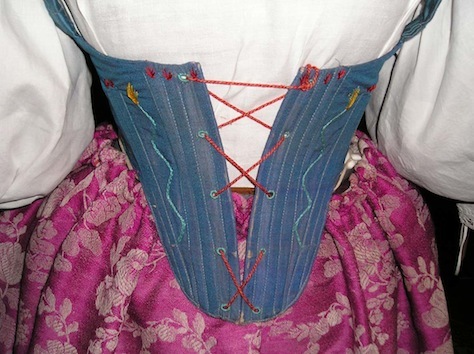 The Jelitko and honzík were fastened from the back to the front on both sides for holding the skirts. They looked like cylinders, made out of coarse fabric and filled with hay, or feathers. In between the honzík there were hooks placed for hanging the skirts on. Sometimes, the honziks were tied individually, fastened to a strip of fabric. Later these developed into so called solid bodice “lajblík”. Originally worn only for daily use, then these became more popular then the živůtek. They were made from a cheaper material than the more expensive brocade fabrics. They were made as the živůtek type, from canvas and supported with whale bones and reed. Honzíks, sometimes called šoršíks, were a continuous part as they had hooks for hanging the skirts. Skirt – the first underskirt was the shortest and the coarsest. The cut was the same as for an apron, tied in the back by lace. It was only a bit wider then the hip measurement, made out of canvas and on the bottom with a wide hem. Around the waist it was gathered into a narrow belt that was just about 15 cm larger than the waist measurement so that when tied together one side of the skirt covered the other. Shirt and bodice were worn over the under skirt. The remaining skirts were hung over. There were five to twelve of them. Each skirt was longer and wider than the one below, and was cut on the side for easier dressing and gathered up around the waist about 12 cm wide, and cut according to the body type. Skirts were made out of strips of fabric, at the top slightly narrower, so that too much material wasn’t gathered at the waist. The length of the skirts was from under the knees to the middle of the calf. The bottom was hemmed with white embroidery. The last apron was the widest and the most decorated, since it was right under the final top skirt. The top skirt was the widest, made out of 6 to 7 strips of material, narrower at the top and gathered at the waist to a narrow double belt. The gathered material was placed at the back, with an open seam in front as well as a pocket that was hidden under the top apron. Skirts were made out of very nice materials, wool, of blue or other colors, but mainly lighter shades. Always only one color though. They had their names as well. It was very important to have all of the skirts the same length, so that when bending it will appear as they were all cut. They came down to knees. Later it became fashionable to wear longer skirts. The width of these was 4 – 5 m.
Fěrtoch – apron, called also baborák, was made out of red wool fabric, with multi color, shiny stripes. It resembled the costume of the Chod women. Aprons were sold at festival markets, and in this way they spread throughout the neighboring towns. They were as long as the skirts and about 130 cm wide, gathered to a belt. Their price was relative to the amount of stripes – one stripe cost 1 golden. Women could wear a white, linen, embroidered fěrtoch as well. There was a wide ribbon worn called pantle for the fertoch made out of silk, tied with little bows, from the front to the back to hide the knot of the fěrtoch. The length of the apron also came to the edge of the skirts. Later the fěrtoch made out of silk, with flowers, a bit narrower and more lively in color, became more popular. It was possible to lace the top over a chord so that the folded material at the waist wouldn’t be damaged when put away. Embroidered fěrtochs were tied with a lace 9 – 10 cm wide and about 90 cm long. At the end they were again embroidered. The ends of the lace fell loosely down with the skirt. Small silk scarf, folded to a square shape was placed around the neck in front, and under the bodice. The most common colors were red, golden, “ hundred flowers” beautifully woven with hundreds of flowers in gold and silver colors. The most beautiful hem of the scarf fell loosely down over the back of the bodice. Edges were richly decorated with hand tied fringes. Little scarves were very expensive and they were hand woven on a specially made loom. Decoration of the head varied depending on the status, different for married and single women. In earlier times, unmarried girls wore so called vínek. Later, replaced by the bonnet with large bows, creating a dove. For unmarried girls the dove was nicely stretched, for married the wings of dove bent down and turned towards the back. Under the bonnet, married as well as single women, would part their hair and in the back tie a knot to have the dove fastened to. Bonnets are round “palice” made out of two parts. 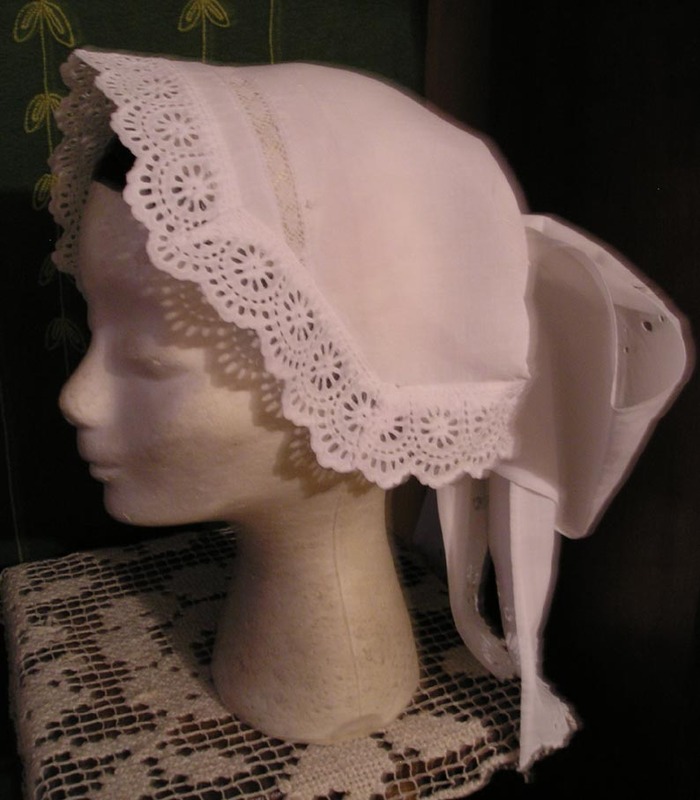 Bonnets are embroidered on a white linen, with while colored string. There was a soft lace placed around the bonnet, directly on the head. That way a relatively small bonnet could stay on the head. Later the embroidering as well as lace was done on tulle (the design was placed on a paper Tulle was stitched and the darning thread pulled through the tulle according to the design, the paper was then pulled out and the embroidery completed). The wings for the bonnet (kalounky or holubice) were about 26 cm wide, and 2.50 – 3 m long. The entire strip of fabric was stitched on the long side and embroidered on the short side with a typical, white, Pilzen design. Flowers are the base of the ornament. The entire decoration is made out of white darning thread and it is 35 – 40 cm tall.) The bonnet as well as the dove are both stiffened with a thick starch, so that they feel like they are cut from paper. Bows are folded towards the center, where they are fastened with a small knot and golden lace. Rich farm women would wear golden bonnets with garnets and large ribbons in the back, for the holidays. Married women would wear over the dove, a nicely embroidered square folded shawl. Stockings were mainly of red color in some parts with a white design, in which a red ribbon was pulled through just below the knees. This ribbon was used like a garter. Shoes were black, decorated with velvet and specially cut peaces of varnished leather and embroidered as well. In front at the cut, there were hooks for a green ribbon to be pulled through. In the 18th. century high, laced shoes were common due to the fashion in the city. Jewelry - threads with cut garners and one or two dukats (coins) in between were worn.